The unconventional starting formation is apparently being "worked on." Ladies and gentlemen may we proudly present the cottages4you team for the National Cyclo-Sportive at this month’s Pendle Cycle Festival. The event, which is also being sponsored by cottages4you, will take place on the 26 and 27 June. As well as being a fit and willing bunch, one team member, Matthew Harvey, actually created the delighful tops you can see in the picture above. 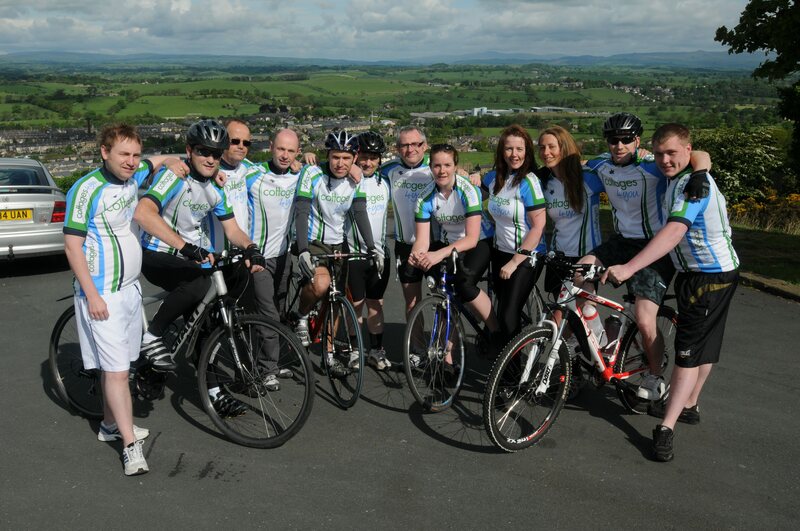 The team, including managing director Geoff Cowley, will probably be too busy climbing the steep inclines of Pendle to appreciate the stunning views on the day but at least they will be doing it for a good cause, the local Pendleside Hospice. “cottages4you has sponsored several major bike races in the North West over recent years and we are delighted to be supporting the 2010 Pendle Cycle Festival. Now that we’ve got pictures of them in lycra there’ll be no backing down, so good luck to the team and everyone else taking part in the weekend’s events! You can find more info on the Pendle Cycle Fest website. Two of the cottages4you team have been blogging about their training regimes. You can find out which team member looks like “Nora Batty’s lycra clad grandson” (their words) on the cottages4you cycling blog.